Hand-carved by skilled artisans with premium finishing. 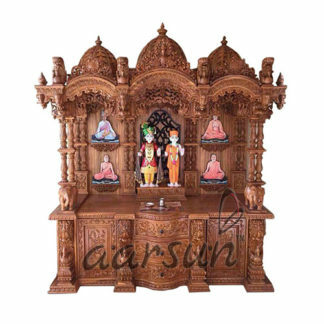 Aarsun woods bring to you this beautiful wooden puja temple made up of Teakwood . This beautiful puja temple has beautiful domes over the roof and the garland area in which finials are placed at the garland area and at the corner of the temple.Rising to the roof there is beautiful carving done by our skilled artisans. The temple is mounted on a flat base and at the front of the temple there are two pillars crafted at the front of the temple.There are stairs at the front of the temple and beautiful circular and curve design which give very sophisticated and elegant look to this temple. 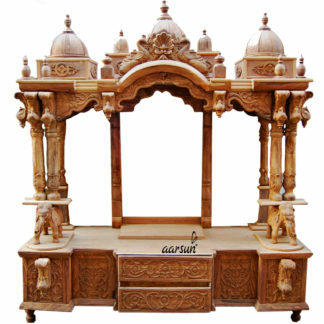 There is beautiful jaali design along with peacock and floral work which give very elegant look to the temple. The temple is best suitable for home and office purpose.